The initial Glastonbury line up has been announced and as Serge stated a few weeks back, The Rolling Stones shall be stealing Kasabian’s their Hard Rock Calling thunder with their Glasto headline spot on the Saturday night. Mumford & Sons will finally headline the Pyramid Stage, I’ve seen them in the John Peel, they turned the place into a barn dance and then on The Other Stage in previous years. See me down the front, probably crying for the duration of Ben Howard. The likes of Haim, Laura Muulva and First Aid Kit have also landed spots straight on the Pyramid Stage (although you’ll only catching me at Haim). Sadly I normally get most excited about the acts I’m going to get to see on my favourite stage, The Park. 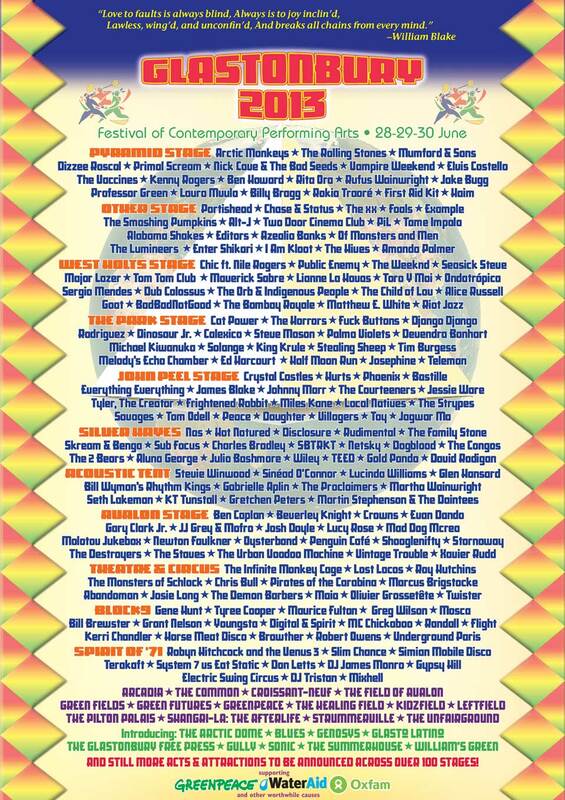 This year the only ones one that stage really tickling my tastebuds are Palma Violets and the legend Rodriguez. After seeing him at Coachella 2012 and him being my favourite act of the whole weekend, I’m super excited to see The Weeknd on the line up, but as much as I love my bands, this chick wouldn’t mind seeing a bit more RnB and Hip Hop added to the equation. We had Wu Tang in 2011 why not throw a bit of Kendrick Lamar or A$ap Rocky in to the mix? I’m being a fuss pot, the line up is good, it’s probably better than good, but I’m not blown away. For me Glastonbury is an experience, after all it’s my favourite place on earth and nothing’s going to change that. Anyway, the first thing I’m doing when I get there is hunting down this insane underground den that I discovered in my final hour in 2011 (providing I was hallucinating from lack of sleep). In the mean time, Emily Eavis you’ve still got time to turn it around and knock my socks off. The newly reformed Sugababes, now known as exactly what their parents probably call them, Mutya Keisha Siobhan, have recently been working with Dev Hynes on a number of projects; one of them being the Blood Orange rework of Pheonix’s, Entertainment. Not being a fan of the original record, I’m a big fan of this version which once again proves why I love Dev Hynes. The distinct voices of the girls, the mellow 80s spin that Hynes loves to put on a track means that this remix is an easy listener. I’m looking forward to seeing what other collabs the ‘Babes’ and Blood Orange pull out of the bag. You can download this song for free from the Soundcloud page. Here’s a track they released with a sample of Kendrick Lamar’s Swimming Pools. I’m usually one to opt for the original over the remix but in this case I think Ryan Hemsworth might have changed my mind.